Prescott, Arizona, is not the typical desert-like city you may come across in the valley. No stretching miles of cacti or tumbleweed, and definitely no blistering heat. Prescott Valley is tucked between the Mingus and Bradshaw Mountain Ranges, and nestles alongside the Prescott National Forest. It is conveniently located just 85 miles north of Phoenix, calling for an easy two-hour drive. Prescott varies from all other Arizona cities because though it is known for some of the best documented history, it is also home to five golf courses, 450 miles of accessible trails, 16 parks and three lakes, and city entertainment on Whiskey Row. Prescott golf is ideal all year round, however is most popular during mid-September to mid-October, when the metropolitan desert courses are over-seeding. This time of the year is perfect to head to Prescott because there you can enjoy luscious fairways, fast, smooth greens, and an unbeatable 80 degree temperature. Prescott has five courses in the center of the valley and two courses located approximately 12 miles out in Dewey. One of the most recognized courses in Prescott is Antelope Hills, which has hosted past PGA and USGA events including: US Open Qualifying tournaments, PGA Pro-Ams, and Arizona State Junior Championships. Antelope Hills consists of two courses, each 18 holes, the historic North Course, which opened in 1958, and the latest South Course, which opened in 1992. The North Course is considered to be the more difficult course with its traditional tree-lined fairways and small greens that require pristine accuracy. The South Course offers a completely different experience with wide fairways, mounds throughout the fairways, and large greens. Antelope Hills is a public course that is open all year round excluding Christmas, with green fees starting at $30 for non-residents. Another unbeatable course to play is Stone Ridge. It has one of the most beautiful views with over 350 feet of elevation drops and inclines. Designer, Randy Heckenkemper is known for making a challenging but player-friendly course that incorporates desert and mountain golf conditions. The course offers specials all year round and rates begin at $40 (cart fee included). If you are an avid golfer make sure to look into Prescott’s other courses: Hassayampa Golf Community, Prescott Golf & Country Club, Prescott Lakes Community, Quailwood Green Golf Course, and Talking Rock. The small town surprisingly packs in other numerous activities, making it a top-notch destination stop. Prescott hosts three of Arizona’s best museums: Sharlot Hall Museum, The Phippen Museum of Western Art, and the Smoki Museum. The Sharlot Museum is an interactive experience, which focuses on the history of the old town. The Phippen Museum has a permanent collection of Western Art, and the Smoki Museum holds artifacts such as pottery and baskets signifying the life of the American Indians. If you are a history buff the town also reenacts the wild west through three different shows: The Prescott Regulators & Their Shady Ladies, The World’s Oldest Rodeo, and Prescott Western Heritage Days. 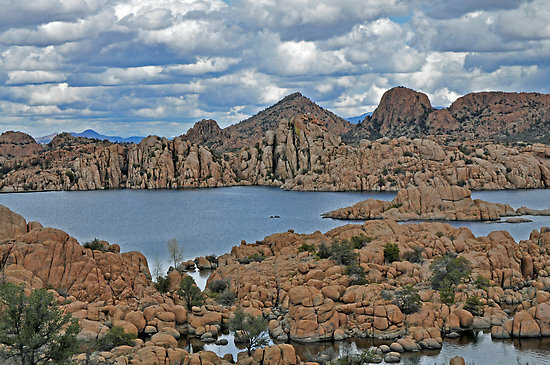 Prescott is perfect for an outdoor-adventure seeker, offering: mountain climbing, hiking, mountain biking, horseback riding, and boating. The majority of Prescott trails are easily accessible by walking or biking. The Mile-High Trail System is the largest trail loop containing 28 different trails which then branch off to sister trail loops including the Prescott Trail System and the Greenways Trail System. Horseback riding is offered to all skill levels. Williamson Valley Trailhead, Thumb Butte, Spruce Mountain and Granite Basin are among some of the most popular riding locations. Watson Lake and Gold Water Lake rent kayaks and canoes as low as $20 an hour or $50 a day, allowing for a peaceful getaway from the busy downtown. Prescott is a tourist friendly destination that will please all interests. Local and out of state travelers can conveniently visit by car, shuttle, or airplane. Prescott Valley is accessible to U.S. Highway 89 and State Highway 69 and 89A, and the Prescott Municipal Airport offers daily service to and from Denver and Los Angeles. Your trip awaits in Prescott today.